A pair of ruby slippers worth millions that were featured in the movie "The Wizard of Oz" and stolen from a Judy Garland museum 13 years ago have been recovered in Minneapolis, the Federal Bureau of Investigation said on Tuesday. 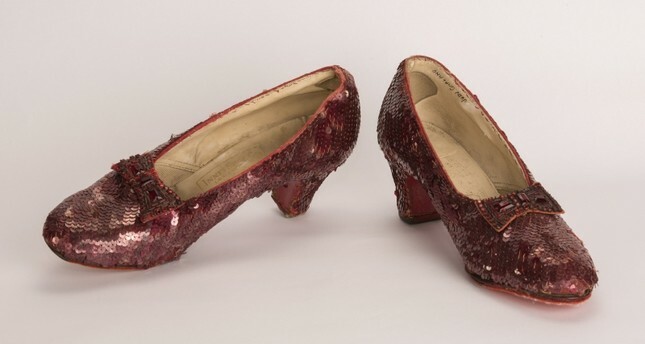 The FBI said it was asking the public to help identify suspects connected with the original theft and a more recent scheme to extort money from the owners of the red sequined shoes, one of four pairs worn by Judy Garland, who played Dorothy in the 1939 classic. "Dorothy's slippers are a treasured piece of Americana, and we are hoping members of the public can help us better fill in the details that will finish the script of this mystery so we can hold accountable all those who were behind the scheme," Jill Sanborn, special agent in charge of the Minneapolis bureau of the FBI, said in a written statement. The slippers, known as the "traveling pair," were stolen from the Judy Garland Museum in Grand Rapids, Minnesota, during a "smash-and-grab" robbery during the overnight hours of Aug. 27-27, 2005 that took less than a minute and left behind only a single sequin. They remained missing for the next 13 years despite an exhaustive investigation by local law enforcement that included a search of abandoned ore pits. In 2015 an anonymous fan of the film offered a $1 million reward for their safe return. The Grand Rapids Police Department sought assistance from the FBI in 2017 over an extortion plot against the owners of the shoes, the Markel Corporation, which led to their recovery. The FBI released few details about that investigation or where they were found in July. After their recovery, the slippers were sent to the Smithsonian National Museum of American History in Washington, D.C. where conservators studying construction, materials and wear patterns of the slippers were able to confirm that they were the missing pair. "We were confident this day would eventually come, and we are grateful to the FBI and all those who worked to bring this piece of cinematic treasure out of the shadows and into the light," Grand Rapids Police Chief Scott Johnson said in a written statement. Garland, a native of Grand Rapids who was born Frances Ethel Gumm, was best known for her role as Dorothy in the film . "After all, 'There's no place like home,'" the chief said, echoing one of Dorothy's most famous lines. The ruby slippers are key in the 1939 movie. After mysteriously landing in the colorful Land of Oz after a tornado hit her farm in Kansas, Garland's character, Dorothy, has to click the heels of her slippers three times and repeat "there's no place like home" to return. Rhys Thomas, author of "The Ruby Slippers of Oz," called the slippers "the Holy Grail of Hollywood memorabilia." "They are maybe the most iconic cinematic prop or costume in movie history, and in fact, in cultural history," Thomas said. "They are a cultural icon." Thomas estimated that this particular pair could be worth between $2 million to $7 million. He said it's not clear in which scenes they were used, but he was "99 percent" sure that they appeared in the film.